NorCal MINIS | Northern California's Premier MINI Cooper Club: Your 2002-03 MINI's Oil Pressure Warning Light On Despite A Proper Oil Level? Your 2002-03 MINI's Oil Pressure Warning Light On Despite A Proper Oil Level? 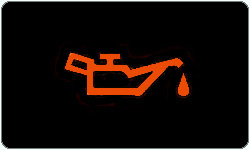 Some 2002-03 Cooper and Cooper S models may turn on the oil pressure warning light even though the crankcase is filled to the proper level. If a check with a manual gauge shows that the oil pressure is okay, go to the starter motor because there’s a good chance its heat shield has chafed through the engine harness, creating a short in the pressure switch circuit. Repairing or replacing the harness and installing a new-design heat shield, part No. 12411495806, should eliminate further trouble.